When to pick gooseberries depends on the variety. 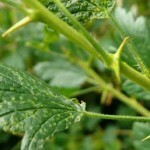 Picking usually starts in late May – before the gooseberries are fully ripe. The first picked gooseberries are hard and tart; these are used for cooking crumbles, pies and tarts. If the gooseberries start to fall of the bush, they need picking. Picking some gooseberries early will thin the crop, and allow those remaining on the bush to grow larger and ripen. They will get softer and sweeter as they become ripe. 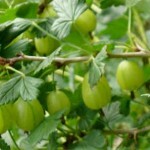 Dessert gooseberries (such as Leveller) are particularly large, soft and sweet when ripe and change to a pinky colour. They are usually ready in late July or August and can be eaten when picked, without cooking. 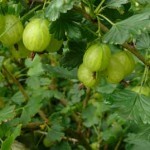 But it is worth picking a few gooseberries in late May , which can be cooked, so that the fruit is thinned out. Gooseberries do not all ripen at the same time, so gooseberry bushes have to be picked several times to harvest the ripe gooseberries. is a very prickly variety so it is worth wearing gloves when picking Invicta gooseberries. The answer to ‘when to pick gooseberries’ is from late May, but pick gooseberries several times, to allow the smaller fruits to get bigger.